This page contains information for those planning to attend the conference. You can find the information you need by paging-down on clicking on one of the following quick-links. If you have questions that are not answered on this page, send email to cseet04@cs.virginia.edu or directly to the General Chair. Now through February 15: Use the registration Web site. Or, register by faxing the form described below. After February 15: You may only register on-site at the conference. You may pay there by credit card (American Express, Diner's Club, MasterCard, Visa), craveler's check, money order, personal check, or company check. A receipt will be provided. Important: Early registration ends Feburary 1 at 5 pm (US East Coast time). Conference fees are higher if you register after that date! All prices given here are in US dollars. To qualify for member and student member discounted registration rates, you must include your current ACM, IEEE or IEEE Computer Society membership number. Additional tickets to the Monday night reception are $40. Student registration fees do not include Monday evening reception, but students may purchase a ticket separately. Additional copies of the proceedings may be purchased for $30. Early registration ends Feburary 1 at 5 pm (US East Coast time). Conference fees are higher if you register after that date! To encourage SIGCSE participants to experience part of CSEE&T'04, we have a special registration option that allows SIGCSE attendees to come to all Wednesday events. See this link for the full Wednesday program. The cost is $65. This includes breakfast and breaks, but does not include lunch or a copy of the CSEE&T proceedings. You can purchase a copy separately for $30. We have kept these costs as low as possible to permit as many as possible to come get a sample of what CSEE&T has to offer. Visa Letters: Speakers, Committee Members, and registered Participants who require a letter from the conference organizers in order to get a visa must send an email to cseet04@cs.virginia.edu with a subject line “visa letter request”. 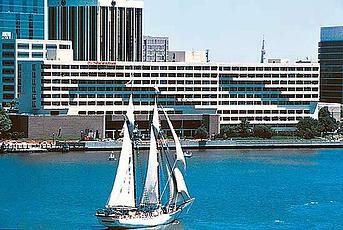 The conference hotel is the Sheraton Norfolk Waterside Hotel. Note: The deadline for reserving under the reduced conference room rate has passed. To find the price of available rooms, click here to register over the Web through the hotel's site. See "Hotel Update" information below about prices and other hotel options. You may also register by phone. In the US or Canada, call 888-625-5144. From other countries, find the link for your region on this page. Although the conference rate is no longer available, the conference will benefit if you still tell them to list you under our meeting code, which is "CSEE&T" or the "Conference on Software Engin. Education." Hotel update, Jan. 29: The CSEE&T reduced rate is no longer available. Also, we understand that rooms at the Sheraton are in limited supply. It's important that you finalize your hotel bookings as soon as you can. Using the Web link above, you may find a rate close to the conference rate if you are eligible for a special discount (e.g. government employee, senior citizen, automobile club, government contractor). The Web page lists several of these, but it might not hurt to phone so you can ask what discounts are possible. If you are attending any part of ACM SIGCSE conference that follows CSEE&T, you should look at their SIGCSE hotel information page. Their reduced rate is still valid, with a cut-off date in "early February", according to their site. (They were able to negotiate a later date, perhaps because they're larger.) However, we don't know if the SIGCSE rate is available for the entire duration of CSEE&T. The SIGCSE site also lists several alternative hotels. If you learn something useful that we could post here, email us. Again, if you do register at the Sheraton at whatever rate you get, please ask if you can be listed as being part of the CSEE&T meeting. Thanks. If you are attending SIGCSE following CSEE&T, you should considering staying in the Sheraton for both conferences. (It's just across the street.) The rate above is valid for the entire period. Because the large numbers of SIGCSE attendees may lead to a shortage of rooms in downtown Norfolk, we urge you to reserve your rooms as early as possible. There are not a lot of hotel alternatives in the immediate area, and none realy offer better rates (that we've found). Here are driving directions to the hotel (provided by the hotel's web site).